Tony Chen Lin brings us a solo performance in conjunction with Chamber Music New Zealand. Born in China, New Zealand pianist Tony Chen Lin's first encounter with music came at the age of 12 with keyboard lessons before advancing to the piano the following year. He made his concerto debut at 14 after winning the Christchurch Junior Concerto Competition. Since then he has won the 40th New Zealand National Concerto Competition in 2007, second prize and the Best Classical Sonata Performance Award at the 2008 Kerikeri International Piano Competition, second at the 2011 Lepthien Piano Competition in Germany, is a multiple recipient of the Dame Malvina Major Foundation Arts Excellence Award, and has received support from the Farina Thompson Charitable Trust, Kiwi Music and Keith Laugesen scholarships. 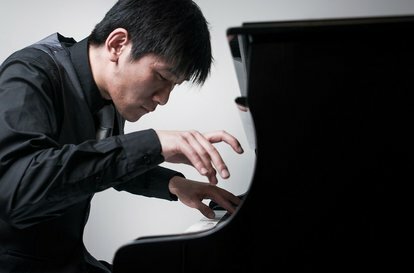 After receiving his Bachelor of Music in piano performance and composition with Peter Nagy and Gao Ping at Canterbury University in 2009, Tony moved to Europe where he completed his Master of Music under Gilead Mishory and Andreas Immer at the Hochschule Für Musik in Freiberg, Germany. In 2015 he graduated from the Konzertexamen (Soloist Diploma) programme with Distinction. He studied part-time with Balázs Szokolay at the Liszt Academy in Budapest, and has benefited immensely from the mentorship of Chilean pianist, Edith Fischer. As a composer, Tony has had works played by the New Zealand Symphony Orchestra, Auckland Philharmonia, Christchurch Symphony Orchestra, and Christchurch Youth Orchestra. He is a four-time recipient of the Lilburn Trust Student Composition Award, as well as the 2007 NZSO Todd Young Composer Ward.